In typical photography or video, creators have a lot of control over what their camera picks up. A key aspect that can help or hurt a final image is exposure. With the field of virtual reality and 360 video expanding rapidly, it is important for budding videographers and photographers in this area to take care to properly expose the images they will capture. 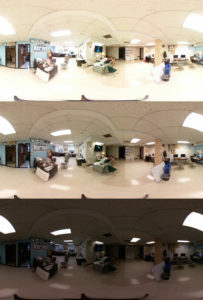 Flattened 360 photos taken at different exposures with the RICOH Theta V.
For this tutorial, I will mostly talk about controlling exposure with the RICOH Theta V. This model is RICOH’s newest 360 camera and allows users to capture high-resolution photos and videos in 4K/30 fps. The Theta V retails for $399.95 and has some accessories, such as a spatial audio microphone, that can be bought separately. I believe that this camera is easy enough for beginners to use, but has enough quality for advanced videographers to use as well. A videographer could manually control when the Theta V records, but he or she should download the mobile app the works with the camera. The app, called “Ricoh Theta S,” can be found for free on the App Store and the Google Play Store. From the app, users can not only turn the camera on and off, but they can preview what the camera sees and adjust ISO, shutter speeds and white balance as needed. Theta V users should note that in order to adjust these setting, the camera must be connected to the phone over Wi-Fi. A screenshot of what previewing an image looks like in the Theta S app. To adjust the exposure, a camera operator needs to open the preview viewer within the app. From there, users can press “EV” in the lower left-hand corner and use the slider to allow more or less light into the camera. The shutter speed, ISO and white balance can also be fine-tuned from this screen. According to 360Rumors, “the correct exposure is the one that shows a real world object at the same ‘brightness” as in real life.” The previous hyperlinked article, which also gives a pretty general overview about exposure itself, said that with most 360 cameras on the market, users have limited exposure control but these types of cameras also are less susceptible to getting the wrong exposure because it can evaluate the whole scene around the camera. As someone who has just learned how to create 360 videos, I did not personally take exposure into account as I should have until was presented a challenge in my recent video that I made with classmate Paidin Dermody. Last month, we decided to film the University of Kentucky’s MacAdam Student Observatory as a 360 video project. The facility is only open on clear nights, which does not allow for much light for starters. Also, some white fluorescent lights were also available within the observatory, but most of the research and study done within the observatory is completed under red lights, which allow person to preserve their night vision. We wanted to be able to authentically capture this uncommon lighting, as we are both journalists and wanted to show what a typical experience is like in the observatory. Thus, we had to learn about controlling the settings on our camera while in the field. Check out our final project below. It can also be viewed on kykernel.com. Next PostNext Disney and VR?